^ Herbermann, Charles, ed. (1913). "Moravia" . Catholic Encyclopedia (in English). New York: Robert Appleton Company. Semple, Ellen Churchill. "The Barrier Boundary of the Mediterranean Basin and Its Northern Breaches as Factors in History." Annals of the Association of American Geographers, Vol. 5. (1915), pp 27–59. 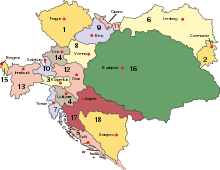 Foundation for Medieval Genealogy: Moravia.